There's nothing like a slice of watermelon on a hot summer day. As soon as you have it in your hand, you know it's going to be good. The green rind is cold and brightly colored. Then there are the bright pink insides, it's wild that that color even exists in a natural food. Once you take a bite, it's like your whole body cools down. This fresh fruit is like a natural air conditioner! Dress up as this summertime favorite and you'll be far from 'melon'-choly. In fact, you'll be fresher than ever. The only thing is, you might cause some serious fruity cravings as you're parading around in bright pink and green! This sweet slice is much more glamorous than your typical slice of fruit. The rind is breathtaking with a sparkly finish. The sweet pink has a shiny surface and the seeds have all the sparkle you could hope for. This elegant melon can easily be paired with both casual and dressy outfits. As it's simply a tunic that slips over your clothes, you get to choose! 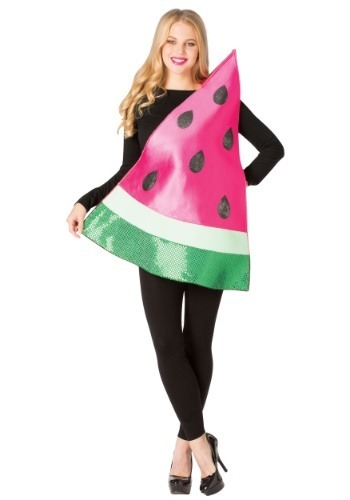 If you're looking for a costume that you can wear more than once a year, this little slice is a winner. As cute as it would be to brighten up a Halloween party, it would be even sweeter when you're marching in a summertime parade! Kids are sure to know that the candy you're throwing out has the most spirit. And since this melon doesn't have any sleeves you can stay cool the whole time. You'll find big and small reasons to get this piece out of the closet through the years. Neighbors holding a tropical soiree? Done. Sweet themed baby shower? Finito! You can wear it again and again and rest assured, you're sure to stay fresh!